If we move to explore into the mystery of the creation process in the 21st Century, we realise that there is no a specific delimited art trend, but rather multiple forms of expression that motivate the creative needs. In this arena we are faced with a labyrinth of questions every time we decide to visit an art exhibition, becoming not only a pleasure for senses, but also an investigation for the mind. We are faced with so much information that perhaps a black box would be needed to understand clearly what happened in the creative process behind a work of art or exhibition. 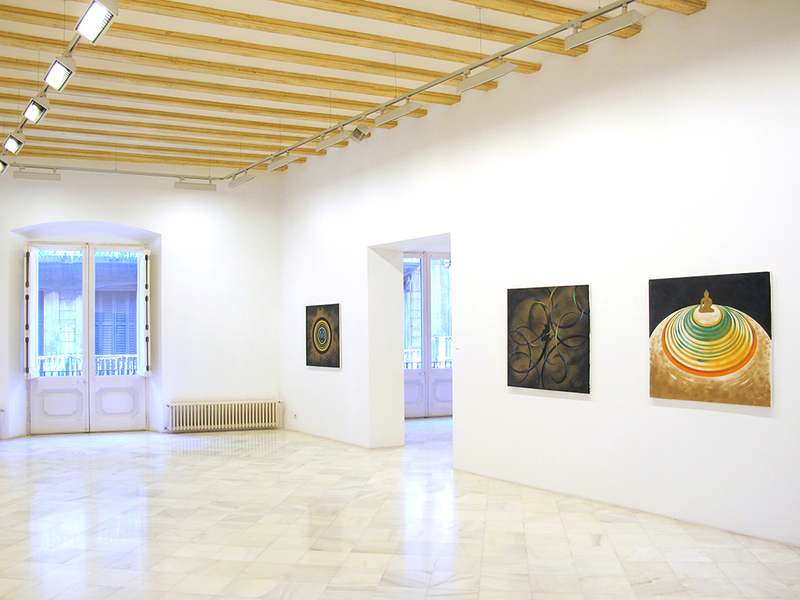 With “Black Box” Miguel Marcos Gallery presents four artists from China, although two of them are of European origin. The artists first met in 2013 in the Kubuki Desert in Inner Mongolia, invited to participate in the “International Summit of Reforestation of the Desert”, organised by the Elion Company Ltd. After this accidental encounter, despite their patent expressive differences, they decided to combine their creative proposals along different exhibitions in museums and galleries all around the world. In this encounter we find Nicolai’s black void and Lin Mo’s celestial lines; Cristóbal Ortega’s disappearing pigments and Dabao’s beautiful simplicity. These four artists have been compared to the four essential elements of the universe: earth, water, air and fire. This fundamental distribution can help us understand their creative differences. From the remote Iceland, drunk of volcanoes and sagas, to the red and golden Spain in blood and spikes, going, of course, by the inevitable Empire of the Centre, which brings his brushes ancient to -now yes- quadripartite concert, the artists aspire to evoke these lines by giving the best of themselves in a process of creative destruction, soul drain, which generates beauty in each of its phases. A beauty that is no longer Aristotelian and includes, since Impressionism in the European pictorial work, newly minted grounds that there is a room for the ugly, the sublime, the delusional, the pop, the imperceptible or the terrifying. The art is now, more than ever, the battlefield against mediocrity; the spiritual arena where it has held the last tournament, the one in which there will be no winners or losers, in which everyone will have their prize, consisting of a passage to the cavern, where the Platonic ideas exert his despotic reign. We welcome, therefore, the four horsemen of the new apocalypse to the border of the fullness that they have set with their talent. Nicolai, Lin Mo, Cristóbal Ortega, Dabao: cloth weavers of Penelope that will never lose colour, shape or texture as it is made with the same threads that are woven dreams. NICOLAI (Reykjavik, Iceland, 1964). Lives and works in Beijing, Paris, Madrid and Reykjavik. Studied Fine Arts from an early age in the studio of his uncle, the painter Oddur Steinthórsson. 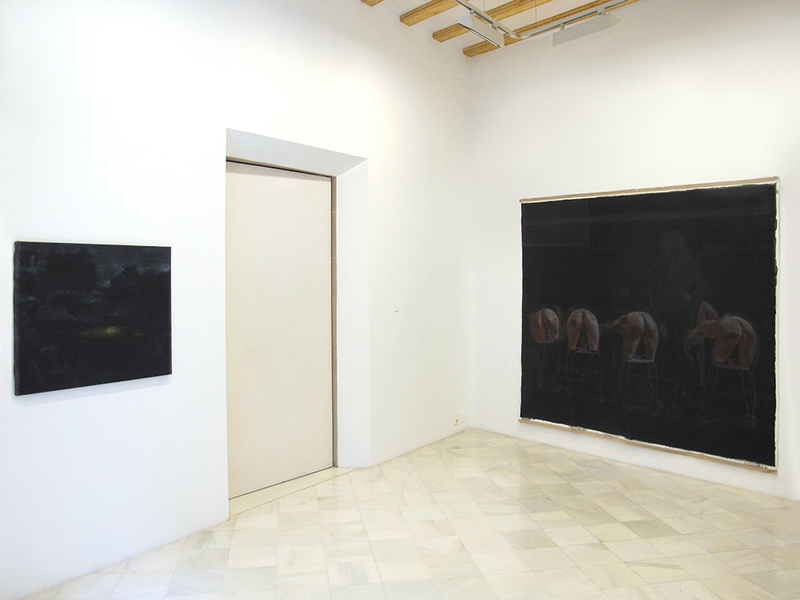 Nicolai’s work is characterised by a black void, as well as by a sacrilegious and sacrificial eroticism. His symbolic conceptualism transmits a poetic vision of nature and its eternal laws. He run his first exhibition in Paris in 1980, “Hommage à Mishima”1980. 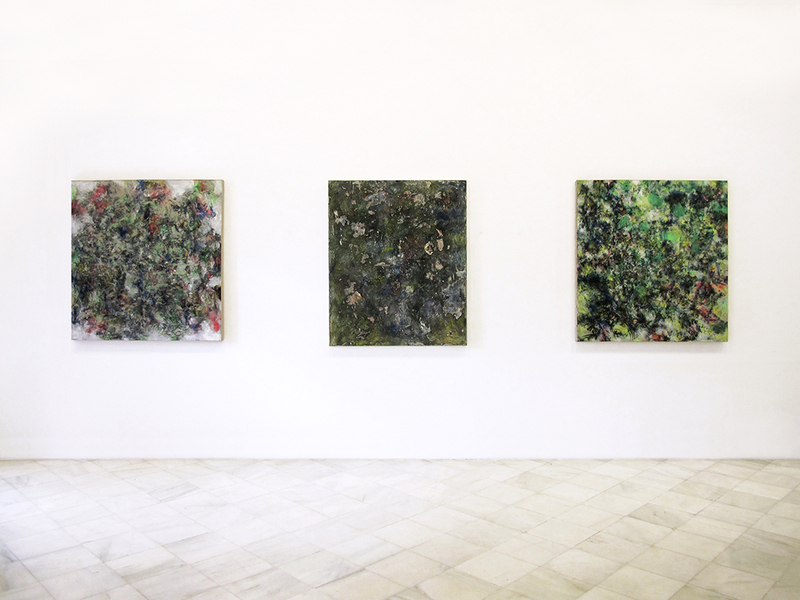 From then on Nicolai’s work has been exhibited in galleries and museums around the world. LIN MO (Harbin, China, 1962). Lives and works in Beijing and Paris. In 1984 he graduates from the Faculty of Fine Arts LAFA, Luxun Academy of Fine Art (Shenyang, China). In 1990 he receives a scholarship to study at the University of Barcelona (Spain), where he works on a cultural exchange between China and Spain until 1996. 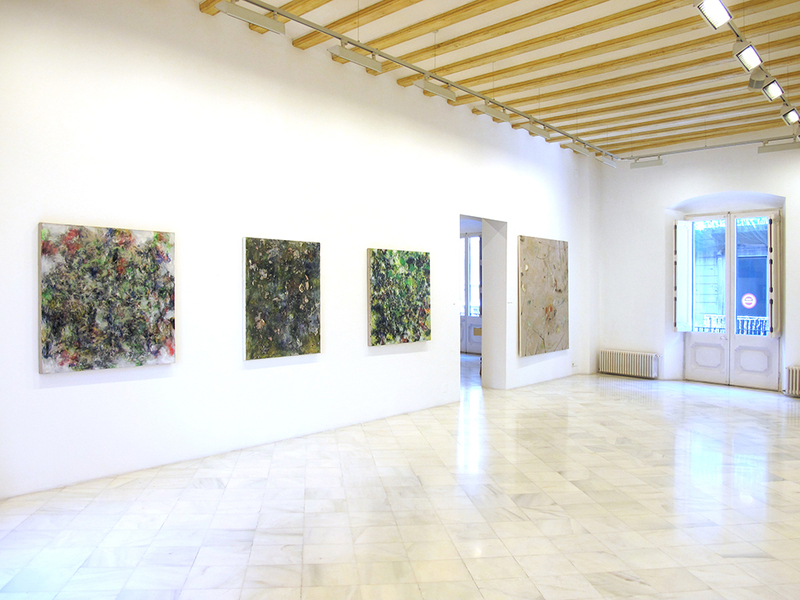 He carries out solo and group exhibitions in China, Spain, France, Italy and the United States. In his painting, neural landscapes harmonize with the land and with a calligraphic pulse. CRISTÓBAL ORTEGA (Alhaurin de la Torre, Malaga, Spain, 1970). Lives and works between Beijing and Malaga. He studies Architecture at the University of Seville. Since 1990 he dedicates himself exclusively to painting. In 2009, after a show at the Cervantes Institute in Beijing, he decided to move to China. His works are pictorial sequences of notes with different timbres and forms that occur as a sweeping score. DABAO [LI YONGMING] (Shandong, China, 1975). Lives and works in Beijing. He studies architecture and professional painting from 1992 to 1998. In 1998 was established Dabao Design Studio. In 2003 was established the community of artists Songzhuang. Since 2010 he becomes the initiator in using sand painting on canvas. His work reflects on the domestic and the sacred.